We are so excited to announce that BASE is being able to give back to our endurance community in a big way! 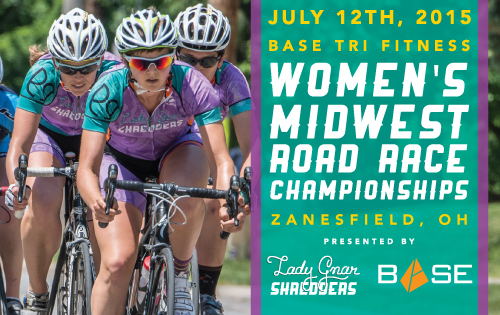 On July 12th, the first ever BASE Tri Fitness Women’s Mid West Road Race Championships will be held in Zanesfield, Ohio. This USA Cycling sanctioned event that will see women from all over the Midwest compete for the title of champion. This event is being produced and run by the Lady Gnar Shredders. They had a vision for creating a world class event with big payouts to the women racing and they sure have done it. BASE Head Coach and Owner, Lauren Updyke, has been a fan of the Lady Gnar Shredders since it started and has been a fan to see how large and invested in the community the team has been. Lauren’s main motivation in sponsoring the event comes from a desire to help see others succeed in their goals. Many friend of BASE race for the Lady Gnar Shredders and we run into each other on the road. Most recently some BASE members who were out riding TOSRV saw a junior female killing it on the 100 mile trip down to Portsmouth, Ohio, rocking her LGS jersey. “We all just looked at each other and said, now THAT is AWESOME” Updyke noted. We are so very excited and will be sharing more news to come via facebook and twitter. And if you don’t already follow the Lady Gnar Shredders – get on it. These chicks rock!